The New York based duo Noizepunk & BorisLove are combining elements form classical, jazz, electronic, house, hip-hop, experimental, etc. It is hard to put into one word the genre of music they are playing, hence they do not try to classify. The originality lies in the openness to musical sound in all its forms, in getting out of the box which constricts our understanding and this duo does just that. 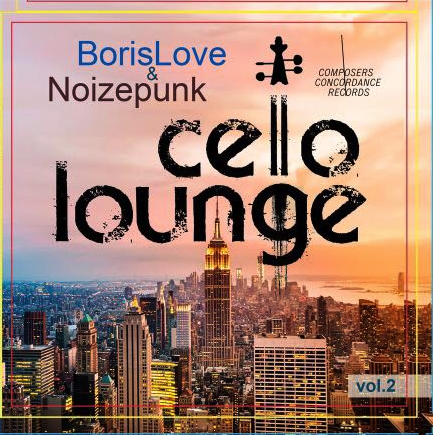 When you hear the duo of Noizepunk & borisLove (Borislav Strulev — cello and Gene Pritsker — Di.J./guitar) you can hear fantastic beats and virtuosic cello playing. Gene’s free rapping over the Brahms, special rap body moves, jazzy with lots of syncopation, live cello over whole thing. The new cd cover is very tasteful and I love how Borislav plays with his name for this project = BorisLove!!! I heard jazz violin many tmes ( more electro) played by many great masters and must say that i was amazed to hear how Borislav Strulev can play in the modern style and still using acoustic cello. GENE PRITSKER AND BORISLAV STRULEV PLAYED FROM THEIR SOULS, LOOKING ON EACH OTHER AND PASSING MAIN THEMES ONE BY ONE. THE CONCERT WAS AT THE MEGA PLACE IN NEW YORK CALLED BIRDLAND. WITH MANY GUESTS FROM USA, CANADA AND RUSSIA. There are so few composers of contemporary music who have expanded its idiom and its language that they can be counted on the fingers of one hand. Among those few, the shape-shifting guitarist/electronics manipulator Gene Pritsker is one of the only composers who continues to break down the barriers that still exist in the sometimes water-tight compartments that industry marketers revel in. 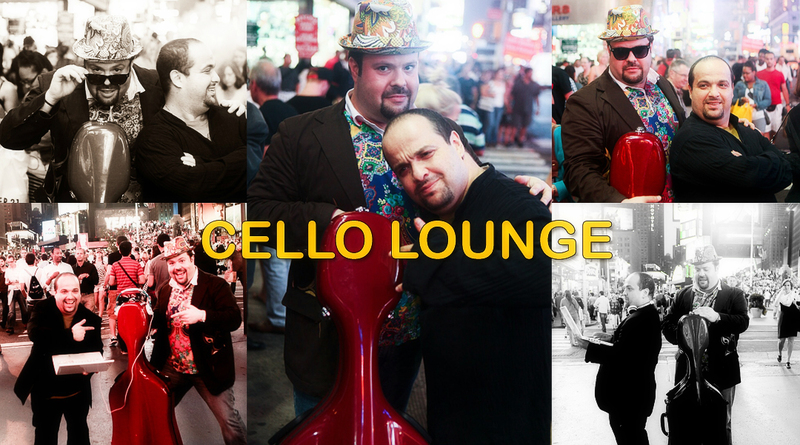 On Cello Lounge, with the equally fearless cellist Borislav Strulev, the iconoclast in Pritsker once more comes to the fore. Here, like on several Bill Laswell albums, Pritsker melds and mashes a myriad idioms and invites cultures to collide: Hindustani vocal with Hip-hop, Carnatic with bluegrass; baroque and rococo with modern atonal music and lounge with everything else. If a mish-mash is the expected result, perish the thought. There is not a dull moment on this duo album. The reason for this exciting musical sojourn is that both Strulev and Pritsker are continuously inventive. The cellist is like an itinerant traveler sweeping across the landscape of his instrument. His left hand is a constant source of magic and it trembles and slides like it has a mind of its own. It travels up and down the strings with absolute abandon; yet it is in complete control and guides the bow in his right hand as it glides across the strings. That right hand seems completely apart from the rest of Strulev’s body, causing his bow to become a magical wand that waves and weaves its way across the taut strings. All this time Pritsker is restless. His guitar twangs and sings in counterpoint. Guided by the electronic beats Pritsker weeps and wails as he traverses miles across the musical landscape. His fuzz box is hyper-active; wah-wah pedals interject warbling effects in the eclectic compositions that skitter and swirl from hip-hop to swing and to the polyrhythms of Indian ragas. Innovation is rife among the written passages and, although cadenzas are not indicated in the score, there is ample room to be creative, which is something for which both musicians show a true penchant. Track Listing: Debussy’s Lounge; BB Gun; Tabla Cello; The Double; San Sans; Kaleeso; Rococo at Twilight; Pravajay; Akoola; Lounge 101; Infinity; Firmly Frozen; Brahmism; Yolachka Bells; Recon; Dead Souls. Personnel: Borislav Strulev: cello; Gene “Noisepunk” Pritsker: composer, D.i.J, guitar; Aaya Mudgal: voice (8); Sebastian Izya Pritsker: voice (14); Greg Baker: classical guitar (16). 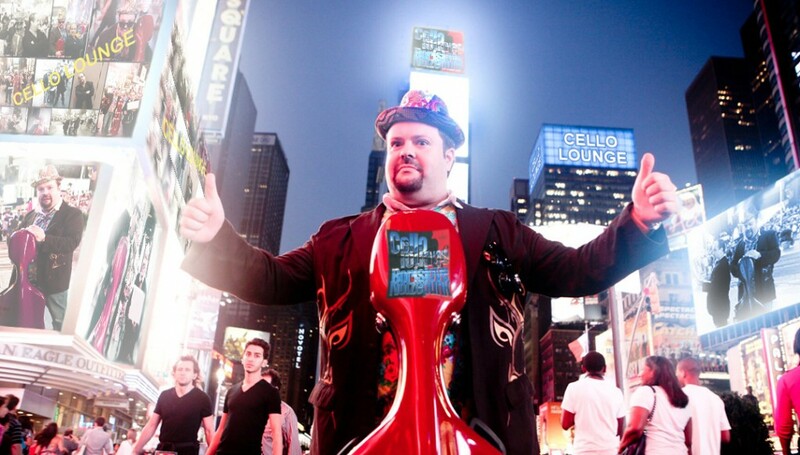 This is a unique fusion CD, with classical, cultural cello themes, mixed with contemporary guitar, echoing vocals, and electronic creativity. You will feel like you are in Istanbul one moment and the East Village, NY, the next. 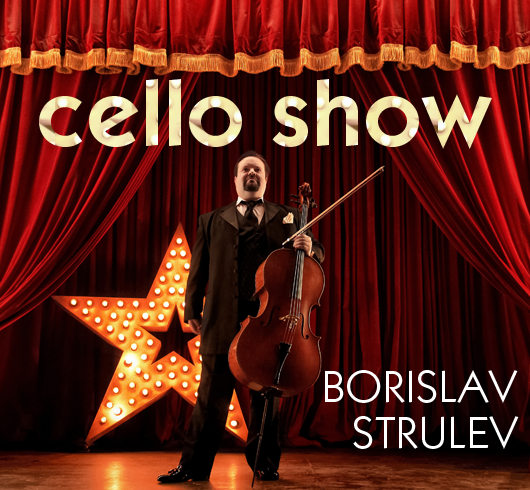 Borislav Strulev is a renowned jazz and classical cellist with Russian roots, and he brings exotic flair to this ensemble. All tracks composed by Gene Pritsker. #4 – The Double. This is music that must be heard again and again to hear all the intertwined musical nuances, that Gene Pritsker has engineered with electronic expertise. 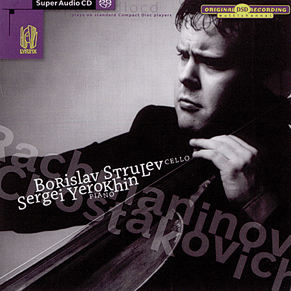 Borislav Strulev’s cello leads the theme’s mesmerizing mélange. A steady percussive beat may be the effect of striking the wooden guitars or something more complex. #5 – San Sans. The listener will imagine he is amidst belly dancers and men in dervish balloon pants, swirling at dizzying speed, as this rousing music unfolds. There’s a clever serendipitous thread woven into this tonal fabric, with raucous tonality suddenly morphing from bass to treble, then to deep and earthy soon again. #8 – Pravajay. This track includes vocals by Anya Migdal, which have been multiplied numerous times for a charming choral effect. 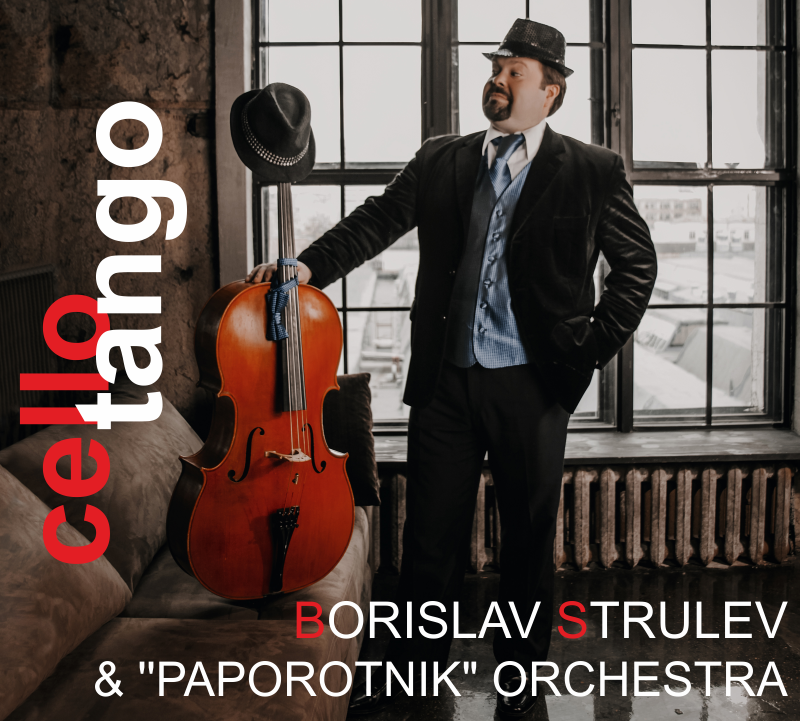 A male vocalist is faintly heard in the background, but it’s Strulev’s cello that carries the vivid momentum, as it’s surrounded by enchanting effects. #16 – Dead Souls. Named for Gogol’s novel, this final track features Greg Baker on classical guitar and Sebastian Izya Pritsker on vocals. Strulev’s cello takes on the entire scale, adding deep soulful refrains and high, soprano-like phrases. This track grips the imagination, and, in its finale, one wants to hear this recording all over again.